Preschool favorite Fireman Sam, the only firefighter-themed children’s program, originally launched in the UK, made its U.S. debut on PBS KIDS Sprout® in October 2006 and continues to air daily. Fireman Sam is ready for action in five exciting episodes! The alarm has sounded and the Pontypandy crew is off to rescue their friends and others in need. From engine sparks and wild fireworks to water rescue and more, you won’t want to miss these adventures with your favorite hero! Emma & Ethan were not familiar with Fireman Sam before this DVD graced our doorstep. When the review was offered to me I agreed because I liked the idea of a program geared towards children 2-5 with a firefighter as the lead character. I felt it was very unique and would capture their attention, as they love fire trucks! I wasn’t let down. The first viewing was a little noisy because Emma & Ethan kept asking me questions and pointing out (and shouting) the fire truck! With five episodes included, the 46 minutes passed quickly but they both enjoyed Fireman Sam. To be honest, I think Ethan was a little more intrigued by the concept. I can see this DVD being requested more often as Ethan is beginning to be more interested in tv time as well. 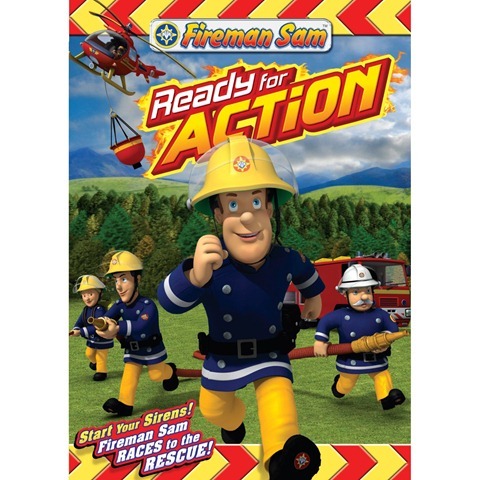 One OurKidsMom is going to win Fireman Sam Ready for Action on DVD! You do not have to be a blogger to enter/win. An email address is required to enter. Please leave it in your comment. The winner will be chosen via random.org and contacted via email. A reply to the winning email is required within 48 hours before a new winner is chosen. This giveaway ends at 11:59 PM EST on January 14, 2010 and is open to residents of the US. I follow on Google Friend Connect and just started following Fireman Sam. My daughters would love this show! I follow on gfc as mommyof3 and i like fire,an sam on fb! I like that there are games and activities for my lil guy to interact with Fireman Sam. Awesome! My little grandson loves the videos at the Fireman Sam website. Following via Google and Liked Fireman Sam on FB! I like the FireMan Sam My First Laptop! Entered Bob The Builder The Golden Hammer DVD giveaway! Entered Tonka Strong Arm Truck giveaway! Entered Charlie Brown Christmas Tales DVD giveaway! I entered the Kinderglo Portable Night Light giveaway. I like fireman sam on FB! I like the games and videos on the fireman sam page! entered bob the builder giveaway! I entered the JoeShopping.com $50 Amazon giveaway. I entered the Bob Builder Golden Hammer DVD giveaway. Entered Barney Musical Zoo DVD giveaway! I LIKE Fireman Sam on Facebook! I follow – gfc – emillie. I follow fireman sam on facebook – emillie rose. I entered the spira odyssey giveaway. I “Like” OurKidsMom on Facebook – emillie rose. I like that there are so many activities that kids can do on their website. I Subscribe to OurKidsMom by Email – using my @gmail.com address. I Follow @ourkidsmom on Twitter and shared this giveaway – http://twitter.com/#!/HisPrincess886/status/22715393911037952. I shared on facebook using the share link – emillie rose. Entered MS Office 2010 giveaway! I follo wyou on google and like fireman sam on facebook. Thanks. I have your link on my blog list! entered barney musical zoo giveaway! I entered the Thomas Giveaway! I like the Music to Your Gears game. I like Fireman Sam on Facebook. I follow via GFC. I am a fan of Fireman Sam via Facebook as Jill Myrick. Like Fireman Sam on FB as lewalk76/Leah W.
I like the Radar the Sniffer Dog game on the site. Shared the giveaway on delicious. And Dugg it on Digg. Added it to my faves on Technorati. Shared this on Google Buzz too. I’m following via Google Friend Connect (Dana). I like Fireman Sam on Facebook (Dana McWilliams). I like OurKidsMom on Facebook (Dana McWilliams). I liked the games on the Fireman Sam website.